After another brief hiatus Grey’s picks up with Mark and Callie in bed discussing their newly minted status as parents, “Wanna get married?” Mark asks Callie who scoffs and quickly exits the room, leaving Mark to contemplate life as a parent whose babymama doesn’t want to share her bed with him. Across the hall, Arizona has returned to her default setting with Callie – righteous indignation – because Callie is knocked up with Mark’s baby and this is terribly annoying for Arizona who expected Callie to remain chaste despite dumping her and moving across the globe to pursue her passions. Arizona is having some difficulty with the concept of, “broken up.” Unfortunately, Callie has no time for such foolishness because she’s all stocked up on self generated foolishness in the form of her obsession with her pregnancy, “I am a hormone casserole” she declares while crystallizing every single fear Arizona – and Mark if he’s honest – had about a knocked up Callie. Twitter has finally made it to Seattle-Grace, which, unlike the rest of the planet uses it for good and not evil. There are no flamewars or twittergaffes for these tweeple. Oh no, there are twittercasts of surgeries and a whole lot of people pretending they know how to text standing around the operating room. When the chief gets wise to the tweeting – and how couldn’t he with all that noise their phones make – he tells Bailey to stop tweeting at work. Of course, Bailey does whatever the hell she wants and continues getting her residents to tweet every stitch, staple and suture. And when called out by the chief she gives him, “Bailey Eyes” and magically the whole thing turns into a teachable moment complete with standard issue “geezers don’t understand technology” tropes in full effect. 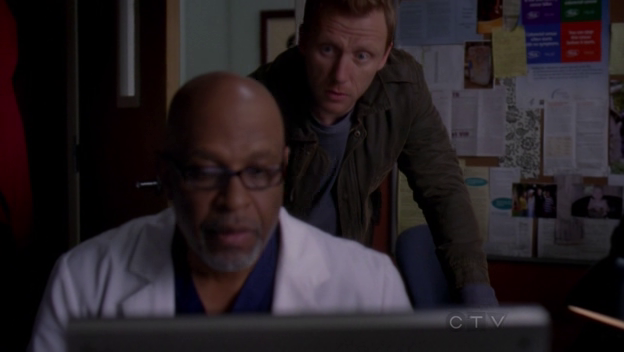 But first, Kevin McKidd (TV’s Owen) wanders away from behind the camera to serve as a straight man for the Chief’s, “I’m looking for Bailey’s teats” joke. Oh, I think the Chief knew exactly what he was saying. So when are Bailey and the Chief gonna make that love connection? Since when is Jackson Avery in the running for Chief Resident? 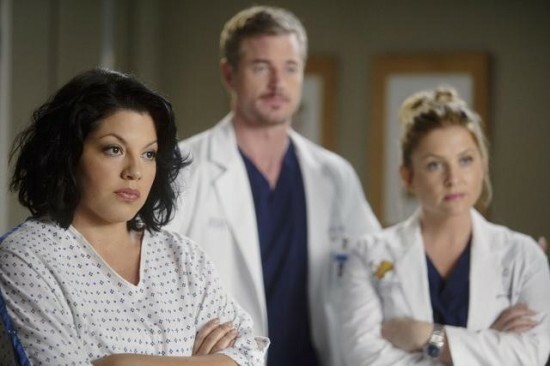 This is a three person race between Alex, April and Meredith, in my opinion. I suppose since Jackson hasn’t been given a proper storyline this Chief Residency competition with Cristina (back in obnoxious form) is as good a storyline as he’s gonna get. Largely forgettable, save Cristina’s compassionate patient care and her deception – get it, because the whole episode is about deception – of Jackson in order to scam a coveted surgery. Jackson has rapidly shapeshifted from the poor man’s Alex to the poor man’s George. Meanwhile, Alex learned himself a valuable lesson about getting in the middle of personal issues between a married couple. While Alex’s work on Derek’s latest and possibly patient killing clinical trial was completely on point, at the end of the day he resigned his position because clearly Meredith is the only person at Seattle Grace who has ever had experience with Alzheimer’s. Biggest loser of the week: Hands down it was Lexie. Once again, her boyfriend has tried to surprise her with a baby out of nowhere. Oops. How did Lexie never find out until cooking dinner for Mark? In what universe does juicy gossip like one doctor’s boyfriend knocking up another doctor not make it onto twitter? Seriously. I can’t believe juicy gossip like that wouldn’t make its rounds. It’s way more juicy than Mer and Der’s relationship. Notice neither of them were in on the twitter action. They’re still stuck on post-its! Like you said at Grand Rounds, Snarky, I was pleased to see Grey’s throw the b-word (bisexual) around this week without being completely ridiculous. She never found out because her tweets are filled up with Bailey eyes magic. Am I the only one who heard David Swimmer shouting “We were on a break!” through the whole Callie-Arizona argument? Please make this storyline end, Shonda. Please.